I had a trial run on this one and 2 minutes is all that I need to set it up. There is so much ventilation as well. I like that they provided 4 windows and a floor vent which I did not have before. Overall, fantastic. 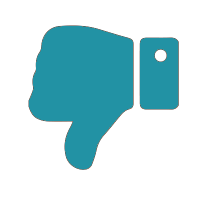 It's not that bad but, honestly, it isn't also durable like I expected it to be. The rainfly doesn't cover the whole tent, so, you better not use it during a rainstorm. Putting it back in the storage bag is also a hassle. Took me about 20 minutes to figure it out. For campers who value space, cabin tents are ideal. The inside is very spacious owing to the design of the tent. Specifically, the walls are positioned at steep angles (almost 90 degrees) to provide more room inside. However, they also have a steep price, which is the main downside of cabin tents. But not for the Core Equipment 6-Person Instant Cabin Tent. It has many of the benefits of cabin tents without the premium price. Check out what this model has to offer. Very fast setup. This tent has the name “instant” for a reason – it can be fully pitched in just one minute. The poles are pre-attached to the tent body, making the process much, much easier. 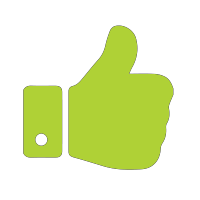 Unpacking and setting everything up does need some getting used to, but once you get the hang of it, the one-minute setup will ring true. Fully freestanding. The tent can stand on its own on any surface. But of course, for best results, secure it to the ground with its assortment of stakes and guy lines. Especially that the tent is a cabin type, it has many flat surfaces around it, making it more vulnerable to being blown away by the wind. Cabin design. This means that the walls are at steeper angles than in dome-type tents. With that, the interior of the tent has more space. In turn, more people can more easily fit. The inside is more roomy. You can even fit a queen-sized bed inside, and there is still lots of extra space. A good number of organizers inside. The interior includes a gear loft, lantern hook, and even a spacious wall organizer. The gear loft is great for items you don’t want lying on the floor, and the wall organizer is good for anything like clothes, books, phones, wallets, keys, toiletries, and many others. The lantern hook is also a nice bonus to hold a light source inside the tent. Has an electrical plug. This tent is also techie-friendly. If your campsite has a power outlet, you can charge your phone, GPS, power banks, and other devices right inside the tent. Ventilated ceiling. The ceiling of the tent is made of mesh, which allows for good airflow into the tent. This is especially useful during the summer and warm climates. You can rest well inside the tent without it feeling stuffy. Wide windows. You can enjoy the view of the surroundings as you rest, making your nature experience a lot more intimate. Large door. 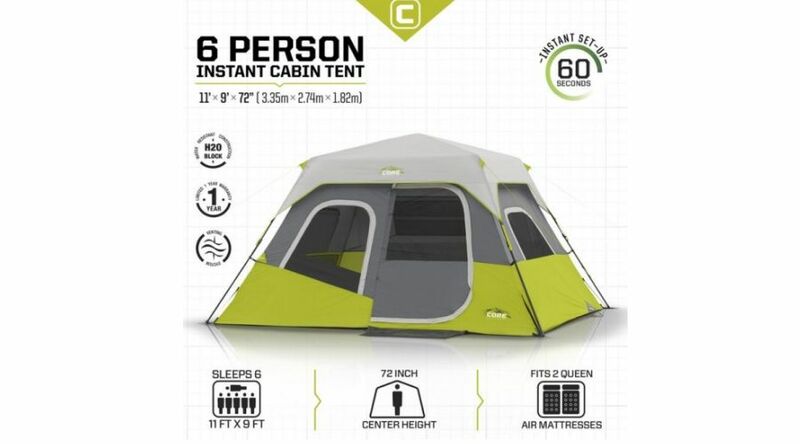 This tent has a door that’s big enough to accommodate most people. Flapped zippers. The flaps on the zippers of the door and windows help to prevent water from leaking in. It’s a nice layer of added protection for occasional light rains. Low price. 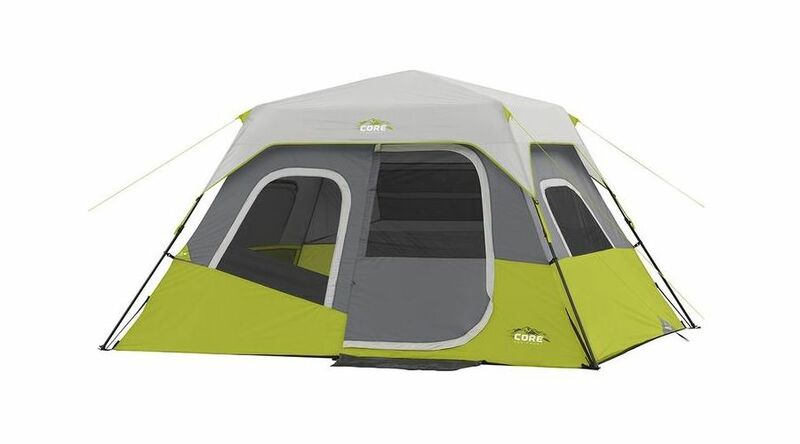 The tent retails for $154.99 info_outline. With that, it’s in the affordable end considering that it’s a cabin tent. It’s a good deal for people looking specifically for this type of tent but without the extra cost. No vestibule. Without a vestibule, there isn’t a rain-protected area to store your shoes and packs. There is a rainfly, but it only covers the ceiling. It cannot provide even a makeshift vestibule area. Does not protect well enough against rain. As the rainfly only covers the ceiling of the tent, the rest of the surfaces are vulnerable to getting wet. Therefore, it is not advisable to use this tent in campsites where you can expect heavy rains. Only one door. As a cabin tent, you could have expected this to have at least two doors. Even a few dome-type tents feature two doors. But with just one, this means some people will have to step over their sleeping tentmates when they need to go outside in the middle of the night. Heavy and bulky. At nearly 23 pounds and with a packed size of 48 inches x 8.5 inches, this tent is only suitable when bringing a car along. Fiberglass poles. It is well-known that fiberglass is not a very durable pole material. That being said, this tent may not be suitable for environments with strong winds. Poles of this material tend to easily snap. Tight for 6 people. With a total floor area of only 99 square feet, the individual space for 6 people to fit would be cramped. It’s better to have only 4 people or fewer. This tent is actually best for a family camping with their kids. Not for cold weather. This is a 3-season tent, which means it really is not appropriate for winter camping. The interior is not designed to hold heat effectively. No footprint. There is no included footprint, and neither is there a separate one for sale just for this model. You will have to look for a footprint that can fit the underside of the tent. 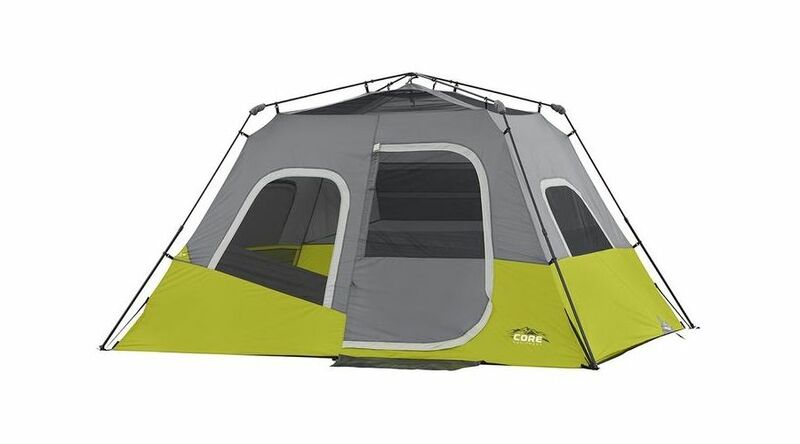 The Core Equipment 6-Person Instant Cabin Tent is best used for car campers in the summer. It is mostly ideal as a calm- and warm-weather tent. It does protect against rain, but only light rains. Heavy rains may leave campers inside drenched. Also, strong winds may topple it. At only $154.99 info_outline, it’s a good deal. As long as the tent is not abused and only used for its intended purpose, it won’t disappoint. Especially for novice campers who do not have a regular habit of journeying through the outdoors.